History in the senior class has focussed on Australia. We have been to Brambuk, in the Grampians to learn about indigenous history of the Wotjobaluk, in the Wimmera. We have read and heard lots of stories about important events in Australian history, like Cook’s discovery of the Great South Land, the First Fleet, the Gold Rushes, Eureka Stockade, Federation and the Great War. We have also learnt about some of the history behind some other regular events, like Cup Day and Remembrance Day, and our local history (see Menzies page). We enjoyed performing the King Midas poem ( at History for kids ) for ourselves and then for the Juniors. We also presented for them a history of the gold rush development and especially at Ballarat, leading to the ‘Eureka Stockade’ and its importance for developing democacy . We followed the description of the difficult journey from Melbourne to Ballarat by some of the first people to drop everything and rush to look for gold. 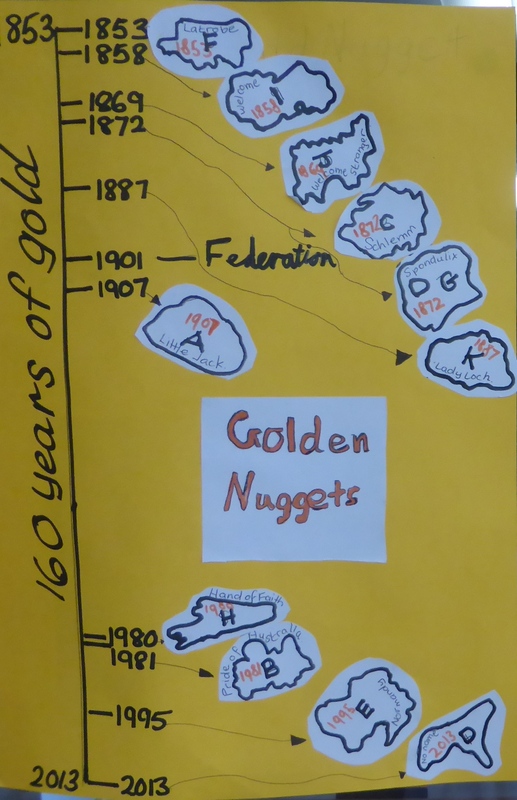 We discovered how important Victoria is in gold nugget history, starting in the 1850’s . The timeline shows two main periods of gold nugget discoveries. We understood that the new technology of gold detectors led to those finds in the last 40 years. 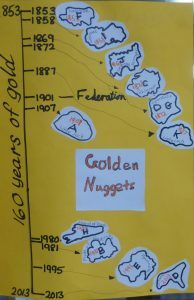 There is more of our activities on gold nuggets on the Geography and Maths pages. The year 3’s joined the Juniors on the Ballarat trip for first hand gold history learning.